I am so happy to be here today while Nettie is away. I am Tara the author of Noshing With The Nolands, www.noshingwiththenolands.com. I was a nurse for many years but now a full time blogger and stay at home mom. My love of cooking started at a very young age where I would cook for my family. That love has continued over the years and now includes lots of time spent in the kitchen with my husband and daughter, creating and entertaining. I also have a new found love of photography, working hard to increase my skills. When pulled away from the kitchen, my family and myself love to explore and travel. 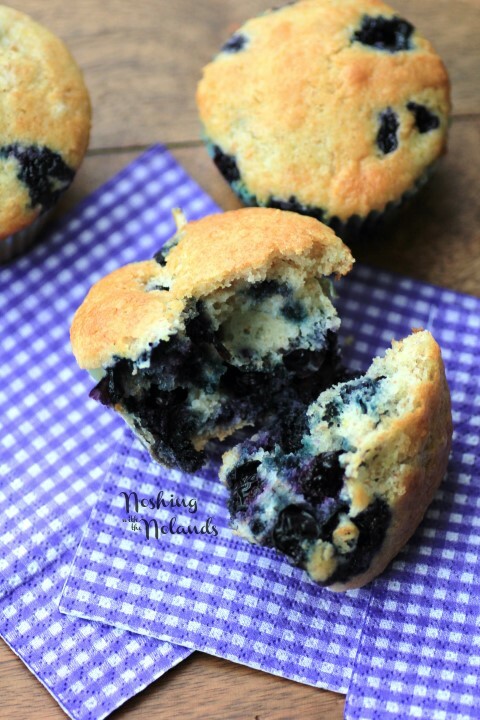 I hope you enjoy today post and these delicious blueberry muffins! I adapted this recipe from Ida’s Barefoot Series of Cookbooks. It had a big crunchy and yes yummy streusel topping but we weren’t wanting that. I also amped up the healthy with some whole wheat flour. Well, they are all gone, disappeared in a flash. Not a drop of butter is needed with these moist muffins, just break into them and start eating!! ENJOY!! A deliciously moist and flavorful blueberry muffin. Line a muffin pan with muffin liners. Preheat oven to 375F. Whisk the dry ingredients together in a large bowl. In another bowl mix together all the other ingredients but the blueberries. Stir the buttermilk mixture into the flour mixture using a fork and mix until just blended. Fold in the blueberries and do not over mix! Fill the muffin liners until almost full. Bake 20-25 min. until golden brown. Let cool in the pan for 10 and then pop out onto a rack to cool completely. You are so very welcome, thank you for having me!! Have yourself a great day!! Very timely post with all the berries showing up at farmers markets! Great recipe, one of my favorites are Blueberry muffins!! !